New York City’s female drumming sensation, Batala NYC is probably best known for having opened for the Rolling Stones or their role in the TMNT II film. Recently, the group decided to change their affiliation from the Batala organization towards the more community based drumming organization, Grooversity. 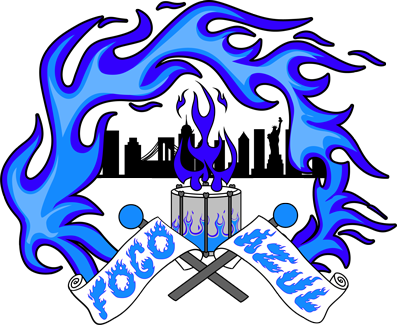 With the change in direction, the group has renamed itself as Fogo Azul NYC or “blue fire”. New York, NY—The all women’s drumming group, Batala NYC has spent years making a name for themselves in the local music community and that local presence has afforded the band roles in movies, opening for sporting events, and the opportunity to play alongside artists like Lorde and the Rolling Stones. The group has brought together women of all nationalities and all boroughs to learn and perform drumming in New York City and beyond. The switch in affiliations from Batala to Grooversity was meant to provide the band with more autonomy and opportunities for community work, something incredibly important to the women who make up Fogo Azul. The subsequent name change was meant to deliver a message about the band’s direction and passion. “We chose ‘blue fire’ because it represents a certain duality but also because it is a unique fire,” says artistic director Stacy Kovacs “We have always been a group that took in and encouraged women of any level of musicality to pick up the drums and play. We have inspired women, young and old, to follow their heart and passions and the support we have received in New York City has enabled us to travel and be a part of events that have been beyond our wildest dreams. This change in name and affiliation enables us to take our performance and our passions to the next level.” By joining with Grooversity, Fogo Azul NYC is better able to shift their focus to one of diversity awareness and drumming for a purpose of positive outcomes. I have had 15 years of writing and marketing experience, the bulk of which were at Fortune 500 companies. I have written for news blogs, fashion magazines, and even write fiction in my spare time under a pseudonym.